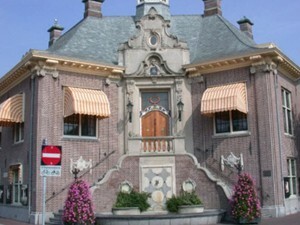 Zandvoort town hall is one of the most striking buildings in the town. Built in 1912 it lies at the heart of Zandvoort overlooking Radhuisplein (Town Hall Square) and was declared a National Monument in 2001. In 1909 the council decided it was time to move to a larger building so they commissioned architect Joh. Jansen to design a new town hall. Construction began on the site between Haltestraat and Kleine Krocht, opposite the post office and close to the end of the tramline. The foundation stone was laid in 1911 with Mayor Beeckman officially opening the new town hall building on 3 September 1912. The building could best be described as butterfly shaped with a very distinctive façade using sandstone and decorations in Louis XV style. 2. The melodic chimes in the tower above the town hall entrance . As the clock strikes on the hour you can enjoy a delightful melody played out by 18 bells (the Dutch call it a Carillon). It has been there since 1981 when it was purchased using funds raised by different organisations and businesses. Over the years the demands on the Zandvoort town council have naturally grown and therefore more space has been required. However, rather than construct a new and bigger building on a different site, the council has opted to build extensions on to the existing town hall. Extensions were built in 1980 and 1995 with renovations to the original building in 2005.